GDP is the total market value of all final goods and services produced in a country in a given year. In Nominal method, market exchange rates are used for conversion. United States is largest economy of world at nominal (exchange rate) basis. With economy of around $17.4 trillion, United States holds a 22.53 percent share of global GDP in nominal terms. GDP of United states is $7039 billion more than second ranked China. China contributes 13.43% of total world economic output. Despite loosing $303 billion in 2014, Japan is still at number 3. Japan is now ahead of Germany by $757 billion. Top ten countries are : United States, China, Japan, Germany, France, United Kingdom, Brazil, Italy, Russia and India. In the list of 10 largest economies, five countries are located in Europe continent, three are in Asia and one each is in South America and North America continent. United States and China contributes 35.96% of world's GDP. 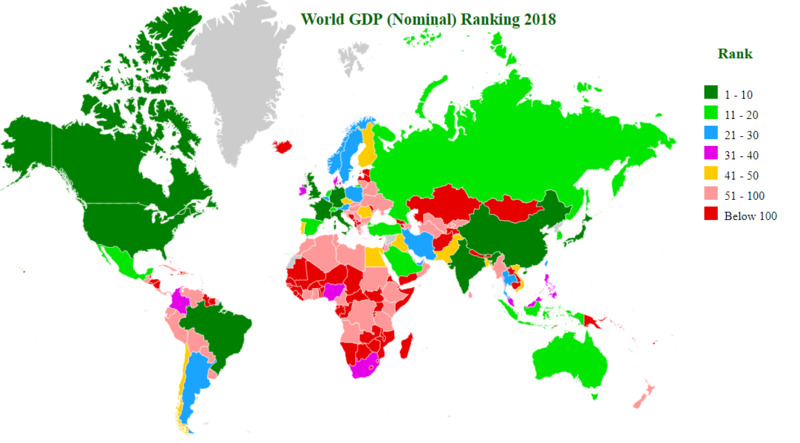 Top 3 countries contributes 41.93% of world's GDP. Top 5 countries shares 50.74% of world's GDP. Top 10 countries contributes 65.3% of world's GDP. Change in Top 10: United Kingdom is now 5th largest economy of world, moving ahead of France. GDP of United Kingdom is increased by $265 billions, but France gains only $40 billion. Another interchange took place between India and Russia. India is now 9th largest economy of the world. Change in Top 11-20: Economy of Canada and Australia has shrinked by $50 billion and $58 billion in 2014. But ranks of both country is still 11th and 12th, respectively. Displacing Spain, Korea is now at 13th position. Next in line come, Mexico, Netherlands, Indonesia, Turkey, Saudi Arabia and Switzerland. Continent-wise - Top 3: Asia : 1. China, 2. Japan, 3. India. Europe : 1. Germany, 2. United Kingdom, 3. France. North America : 1. United States, 2. Canada, 3. Mexico. South America : 1. Brazil, 2. Argentina, 3. Colombia. Africa : 1. Nigeria, 2. South Africa, 3. Egypt. Oceania : 1. Australia, 2. New Zealand, 3. Papua New Guinea.